Industry Experts released the 2017 version of its global report on Specialty Chemicals global market. 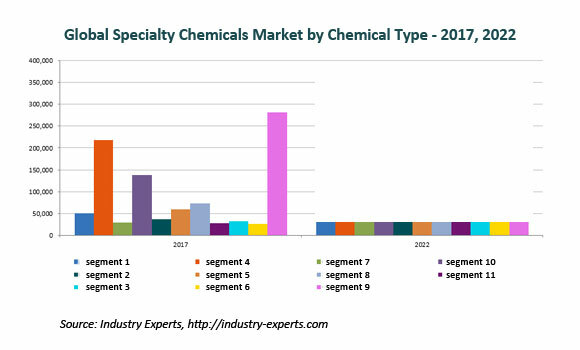 The new report titled ‘Specialty Chemicals – A Global Market Overview’ provides a comprehensive in-depth analysis of the major segments of specialty chemicals. Asia-Pacific leads the global market for specialty chemicals, which is also poised to post the fastest 2017-2022 CAGR of 6.1%. Over the last decade or so, demand for Specialty Chemicals has been somewhat subdued, with overall profitability taking a hit due to a more competitive environment. The 19-month period between December 2007 and June 2009, recognized as the Great Depression, hit a body blow to the Specialty Chemicals industry. Given the niche nature of the sector and the high-value products comprising it, recovery was slow and has been maintaining periods of crests and troughs ever since. To take a case in point, the global market for Specialty Chemicals witnessed a decline of 10% between 2008 and 2009, experienced a strong growth of 16% in 2010, before again tanking in 2011. After modest gains in 2012, the period between 2013 and 2015 again posted handsome growth, a trend that is likely to continue over the coming 5-year period. China and India, in particular, have emerged as major chemical hubs and currently are home to some of the biggest names in Specialty Chemicals. On the other hand, China has moved away from being a low-cost producer focused primarily on exports to cater to the fast growing market for high-value and high-quality downstream products. Increase in competition and commoditization of mature products imply that there is no option other than innovation to survive in the industry. Worldwide market for specialty chemicals is projected to touch US$1.2 trillion by 2022 from an estimated US$970 billion in 2017. Adhesives & Sealants, Agrochemicals, Coatings and Engineering Thermoplastics constitute the largest segments in the global market for Specialty Chemicals, together cornering an estimated share of nearly 50% in 2016. In terms of growth, however, the most promising segments include Electronic Chemicals, Nutraceutical Ingredients and Construction Chemicals, among others. The report reviews, analyses and projects the Specialty Chemicals market for the period 2012-2022 globally and the regional markets including North America, Europe, Asia-Pacific, South America and Rest of World. Global markets for specialty chemical types analyzed comprise Adhesives & Sealants, Agrochemicals, Catalysts, Coatings, Construction Chemicals, Electronic Chemicals, Engineering Thermoplastics, Nutraceutical Ingredients, Specialty Films, Water Treatment Chemicals and Others. The regional markets further analyzed for 13 independent countries across North America – The United States and Canada; Europe – France, Germany, Italy, the United Kingdom and Rest of Europe; Asia-Pacific – China, India, Japan, South Korea and Rest of Asia-Pacific; South America – Argentina, Brazil, Mexico and Rest of South America. This 434 page global market report includes 187 charts (includes a data table and graphical representation for each chart), supported with meaningful and easy to understand graphical presentation, of market numbers. This report profiles 45 key global players and 66 major players across North America – 32; Europe – 19; Asia-Pacific – 13; and Rest of World – 2. The research also provides the listing of the companies engaged in specialty chemicals industry. The global list of companies covers the address, contact numbers and the website addresses of 264 companies.